Gondia: A video of women patients on their beds, with almost knee-deep rainwater flooding the wards in a hospital here, have gone viral on social media. Gondia district collector Kadambari Balkawade issued notices to officials including the dean of the Bai Gangabai Government Hospital for Women and the district civil surgeon for not taking necessary preventive measures to avoid flooding of the hospital wards. The viral video clip shows women patients and their kin sitting on beds in a ward which had almost knee-deep water after heavy rains on July 5. Some articles like chappals can be seen floating in the water. 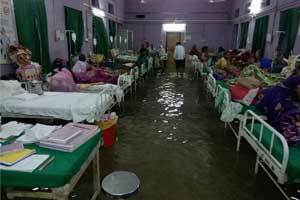 Yesterday also, rainwater accumulated in two wards of the hospital. There was also around a foot-deep water in the delivery wards, causing inconvenience to patients, social activist Kushal Agrawal, who visited the hospital late last night, said.